Give your company and clients a unique and hopeful holiday greeting with our Golden Peace corporate holiday cards. Illustrated on Double Thick White Recycled paper. 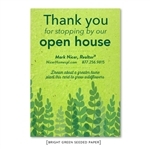 Created & printed on 100% recycled paper, in San Diego, California.